We're embarrassed that it took us so long to shoot a video review of such an immensely popular sport and track riding leather pant. 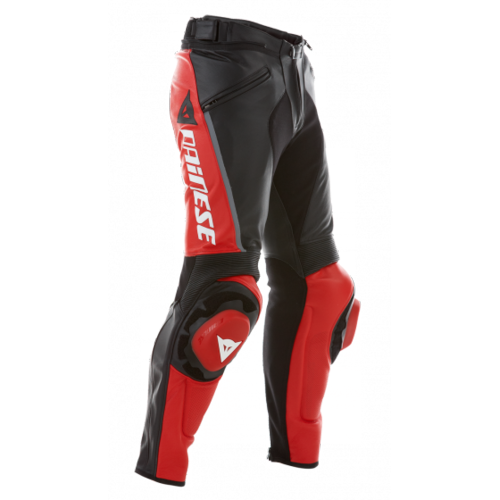 As far as race-level leather pants are concerned, the Dainese Delta Pro Leather Pants are THE bestselling pair at RevZilla. Classic premium Italian leather construction combines with innovative materials and high levels of protection to make a premier leather race and track day pant, the quality of which matches what we've come to expect from Dainese. another protective element to these pants. For comfort, there are velcro straps on each side of the waist that allow for adjustability and cinching. Above the knees is accordion stretch paneling that allows for ergonomic movement when getting in and out of the tuck position. The calf features a double zipper system: one zip for the actual closing of the pant leg and another zip which operates as an expansion panel. This allows for boots to be worn that can fit either inside or outside of the pants. The liner is completely sanitized, there is strategic reflective paneling, two front outside pockets, leather reinforcement in impact areas and a full 360º for connection to a race jacket and track-day legality. The numbers speak for themselves. These bestselling leather race pants offer great style combined with exemplary performance characteristics; a match for their quality and attention to detail will be difficult to find. However, be sure to check out our full selection of Motorcycle Race Pants and Leather Motorcycle Pants to see if there is a pair that'd be a better fit for you application.